The war on Christmas is now international with Muslims stepping in to take pot shots at the holiday. The 41-year-old shocked Christians and even those of his own faith by branding yuletide festivities as “the pathway to hellfire“. Isn’t it strange that a Muslim would condemn the birth of Jesus as a pathway to Hell since under Islamic teachings, Jesus was a prophet of God. So wouldn’t honoring this prophet be an acceptable idea? I guess not according to Anjem Choudary. 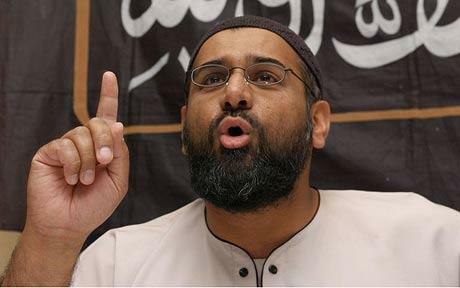 In October of 2000 Choudary issued a press release as the UK head of Al-Muhajiroun, threatening British Jews not to support Israel in any way. The press release said, in part, that it is an “Islamic obligation upon Muslims everywhere to support the Jihad against those who fight Muslims anywhere in the world or who occupy Muslim land,” “the Qur’an is explicit in making Israeli aggressors and occupiers legitimate targets for Muslims wherever they may be” and that “if you support Israel financially, verbally or physically you will become part of the conflict.” And did the British government arrest him for this act of hatred? No. Choudary told a reporter, “Whoever insults the message of Muhammad is going to be subject to capital punishment. I am here have a peaceful demonstration. But there may be people in Italy or other parts of the world who would carry that out. I think that warning needs to be understood by all people who want to insult Islam and want to insult the prophet of Islam.” Police launched an investigation into the protest, but no charges were laid. At the end of the day, when we say “innocent people” we mean “Muslims”. As far as non-Muslims are concerned, they have not accepted Islam. As far as we are concerned, that is a crime against God. Choudary lost no time in seizing upon the Archbishop of Canterbury’s well-publicised remarks in February 2008 concerning shariah law in the UK. He held a public meeting in Harmony Hall, Walthamstow, calling for the implementation of Shariah law in its entirety in the UK. In posters that were fly-posted near tube stations in East London, he billed himself as Judge of the Shari’ah Court of the UK. Speaking a conference on September 11th, 2008 in London, Choudary, referring to the high birth rate of Muslims, stated that “It may be by pure conversion that Britain will become an Islamic state. We may never need to conquer it from the outside.”. He also stated that “We do not integrate into Christianity. We will ensure that one day you will integrate into the Sharia Islamic law.”. 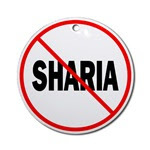 Speaking at a UCD Debate on Shariah Law in Ireland, Anjem contended that Shari’ah law is the future for Ireland and Britain and was opposed by professors and students of the University. By his own words does he admit that Islam is not a religion of peace. So now he hates Christmas. Maybe he should move to a nation that he would be happy in, but alas he can’t. He was thrown out of Lebanon in 2005. They don’t want him either. And what does the Association of Muslim Lawyers say about their leader’s words? Nothing. They neither condemn nor condone. They are silent. And silence equals consent. By their silence they are agreeing with Choudary 100%. So much of a joyous Christmas with your Muslim friends. Pretty soon it will be illegal in Great Britain to even celebrate Christmas. But don’t worry, you can celebrate Eid and slaughter a goat instead. A seven-minute video titled “For Every Pharaoh [sic] There Is a Musa,” uploaded to YouTube on December 7, 2008, shows two groups of protesters in Islamic garb – one in a park holding signs, and one marching, with police protection, on a residential city street. Both groups are led by speakers with megaphones; the one in the park focuses on Abu Hamza Al-Masri, the Egyptian-born former imam of London’s Finsbury Park Mosque who is currently serving a prison sentence in London,(1) and the marchers focus on the oppression of Chinese Muslims. (2) The location in both cases appears to be London. Protester 4: leads call and response in Arabic. Song continues in background. Protester 2: “Because you handed over your brother to those disbelievers and he is gonna face torture in American prison, he could even face death [unclear] – What kind of [unclear] Muslims have we become? There is no concern for Muslim brothers no more. There is no concern about the ulema. “These Middle Eastern people are on the front line, working for Islam, speaking the truth against those tyrants, against the British establishment who has a history of occupying and killing, massacring Muslims, and those [unclear] that divide Islam. It is because if they cannot tell us what is the [unclear], what is the haram. They remind us that there is none worthy of worship but Allah, and that the prophet Muhammad is the messenger of Allah. It is like those brothers, like Abu Hamza, it is like [unclear], like Abu Hamza, who Allah bless [unclear] so that they can [unclear] reminding us of our Islamic duties. Speaker: “If we live in a society where Islam is not in the ruling system, we need to work to change that. (1)For more about Abu Hamza Al-Masri, see MEMRI Special Report No. 37, “Arab and Iranian Media Reactions to the London Bombing – Part II: ‘The Attacks Were Anticipated Due to British Leniency to Extremists Acting in Britain’- ‘Expel Extremism Today,'” July 12, 2005, http://memri.org/bin/articles.cgi?Page=archives&Area=sr&ID=SR3705; MEMRI Special Dispatch No. 921, “Arab Criticism of Muslim Extremist Activities in the West,” June 10, 2005, http://memri.org/bin/articles.cgi?Page=archives&Area=sd&ID=SP92105; MEMRI Special Dispatch No. 762, “Sheikh Abu Hamza Al-Masri on Martyrdom and the Love of Death,” August 12, 2004, http://memri.org/bin/articles.cgi?Page=archives&Area=sd&ID=SP76204; MEMRI Special Dispatch No. 410, “Islamist Leaders in London Interviewed,” August 9, 2002, http://memri.org/bin/articles.cgi?Page=archives&Area=sd&ID=SP41002; MEMRI Inquiry and Analysis No. 72, “Radical Islamist Profiles (1): London-Abu Hamza Al-Masri,” October 17, 2001, http://memri.org/bin/articles.cgi?Page=archives&Area=ia&ID=IA7201. “Islamist Websites Monitor No. 20,” November 10, 2006, http://memri.org/bin/articles.cgi?Page=archives&Area=sd&ID=SP135206 . See also MEMRI Urdu-Pashtu Blog “New Al-Qaeda Leader Appointed For China,” http://www.thememriblog.org/urdupashtu/blog_personal/en/12090.htm. (3) This video is part of MEMRI’s Jihad & Terrorism Monitor Project Studies Archives. British Law can go to hell! That just about sums it up nicely. No talk of assimilation or even partial assimilation. Do what we demand or else! The cry of every bully and thug since the human race began. And I can tell you that these thugs, these bullies, these barbarians don’t get arrested for this. No they are treated as if they were made of china. They must be appeased and placated. One must not criticize them or you will be arrested instead. Just like dear Lionheart who has been silenced by these goons. While the barbarians grow bolder forcing their archaic 7th Century beliefs on all, the native people of Great Britain are imprisoned and fined for speaking their mind or just saying no to one of these gangsters. Already in Great Britain these barbarians have gotten the school system to remove all references to Christianity and British History. They have forced schools to remove or change their annual Christmas pageant, after all it conflicts with their holiday of Eid. You know that wonderful holiday that is culminated by the ritual slaughter of goats. I wonder why PETA hasn’t screamed about that yet. But if they did, they would also be subject to the Dhimmi laws prohibited protest about anything Muslim. So PETA is safe. It only goes after Jews and Christians now. Then there is Shar’ia Law. There is no way that Shar’ia can ever be compatible with any Democracy. There is no equal justice under the law. Women are treated as only 1/4 of a person. Nice. Under slavery in the US at least a black person was considered 3/5 of a person. I guess that the British government is ok with that too. For they have allowed Shar’ia Law to become the Law of the Land. And now the whole world is poised for the biggest scam in the history of banking. Welcome to Shar’ia Financing! A scam that will totally destroy the world’s banking system. And it will be forced not only on every bank in Great Britain, but on every bank in the world. See how every economy tumbles when this scam finally is fulfilled. The British are well under way to their Dhimmitude, unless their native people remember their Celtic/Saxon/Pict heritage and drive these barbarians back to their homeland. And now the US is starting to go the same route. Do we have the courage to say NO to the barbarians and demand that US Law be enforced and not Shar’ia? I pray to God that we do. For over 2 weeks now Shar’ia Law has been incorporated into the British legal system. This was done to appease their Muslim minority. The government officials stated that this would not impact on the average Brit. Yet just looking at this report now, we can see the effect of caving into the wishes of the minority, and the impact on the majority. More than 150 people have signed petitions imploring Luton Borough Council to deny the new Tesco Express in Bury Park an alcohol licence. The bid from the supermarket giant has upset Muslims living in the area, some of whom say they find the idea of alcohol being sold offensive. And what would happen if they did this all over Great Britain? How long will it be until the Muslim minority will close the pubs? Demand women to wear the hajib? Force the full Dhimmitude on the majority? How long would it be until the average Brit would take to the streets and riot? This is why we in the United States must resist all attempts to incorporate Shar’ia Law into any aspect of our legal system. This is why each and every time groups like CAIR try to force employers and communities into giving special treatment to Muslims, we must oppose it forcefully and with all our means possible. Shar’ia Law isn’t compatible with the US Constitution!